The Motivating Mississippi – Keys to Living Healthy Living program is the State and School Employee’s Health Insurance Plan’s wellness and preventative health program. 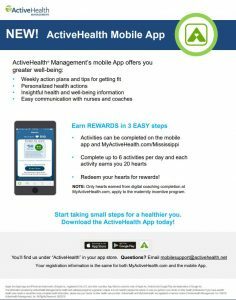 Working with ActiveHealth Management, the Plan’s health management vendor, Motivating Mississippi is dedicated to providing Plan participants with the tools and resources to help them lead healthier lives. You can create a personal health and wellness account on their website through MyActiveHealth to access wellness tools such as a Personal Health Record, Digital Coaching, and Health Assessments. See more details here. Motivating Mississippi Wellness Webinars are 45 minute long wellness sessions available to University of Mississippi employees. The 2018 Webinar calendar can be found here. Webinars are offered at 9:00am, 11:30am, or 3:30pm CT.
MyActiveHealth also provides valuable information through our Transformation Tuesday Series, an hour long wellness program focusing on a range of different health topics offered once a month. For additional information, contact Human Resources at hr@olemiss.edu or (662) 915-5431. To register for the individual workshops, visit our Learning + Development website. Stay connected to your health wherever you go. Download the ActiveHealth app to get action plans, fitness tips, personal coaching, and more. Email mobilesupport@activehealth.net to learn more.